Over 80 people dead. 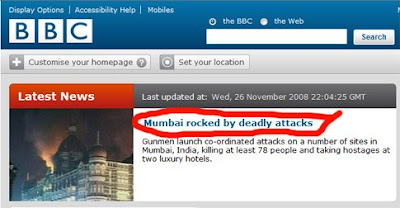 Hotels and hospitals attacked. 4 Top cops killed. Army called in. Guests held hostage. Tourists in panic. Its complete chaos all around. Murder and Meyhem in Mumbai. Terror has struck like never before. As I write this, I watch on TV - almost every news channel is covering this live - a fire growing atop the heritage building of Taj Hotel. I see the smoke engulfing Hotel's dome. I hear gun fire as the army is storming into a Hotel. I see the TV news reporters cover their head and ears between their hurried words into cameras. And if watching all this on TV is scary. I wonder how the people there must be feeling. Particularly those families of the dead, those people held hostage, those policemen crouching outside hotels, those doctors looking at the injured, and those pamedics lifting the corpses. Oh.... the ugly face of terror! Where is it taking us all? Why O why do these shameless cowards attack the innocent?? Why O why do these misguided fanatics create such havoc? Why O why do these tactless terroritsts trauamatise the commoners? Whatever their cause is, whetever they are fighting for, does it merit this horrible blood shed? Does this massacre solve their problems? Why don't they realize that it is in no way going to further their cause. I strongly feel that 'they will be brought to justice' is a too soft a phrase. Its just a worn-out platitute and cliche. These horrible mudereres should be not just quickly caught, but they should also be so.... so very...severely punished that no one should ever dream of doing this again.